Stacey Sager has more from the West Side. 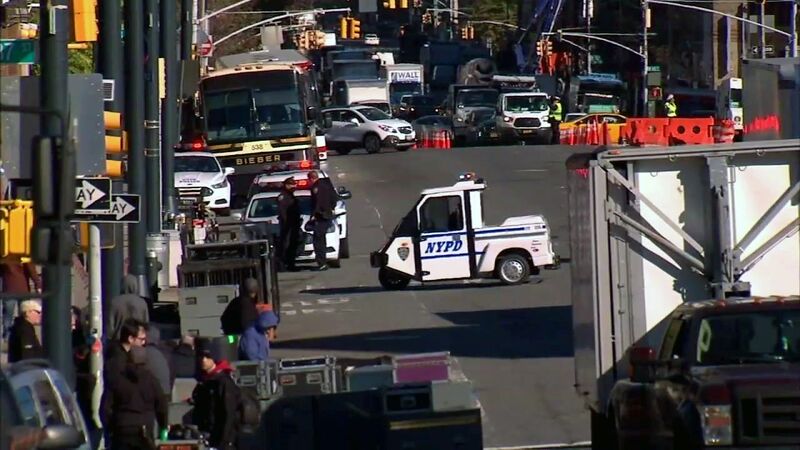 NEW YORK (WABC) -- Both presidential campaigns are holding Election Night events in New York City, prompting the NYPD and Secret Service to roll out a massive security operation. It is the first time both presidential candidates will be in New York City on Election Night since 1944. Hillary Clinton's campaign will hold its event at the Jacob Javits Center, while Donald Trump's campaign will be at the New York Hilton Midtown. Frozen zones have been established around those two locations before the candidates' arrival Tuesday night, and presidential-level security is expected when they move through Midtown. Shannon Sohn gives a rundown of the street closures in effect for Election Day. Additionally, trucks are banned on sections of Fifth, Sixth and Madison avenues through Midtown. NYPD officials also discussed an ISIS call to attack voters, , which they called a standard pre-event threat. They reiterated that the election eve threat roundly dismissed last week "lack(ed) specificity and currently the credibility and the sourcing of that information is under investigation." The FBI and NYPD had been assessing the credibility of a possible terror plot that mentioned New York, Texas and Virginia. The NYPD said Hillary Clinton's campaign had a permit for fireworks over the Hudson River, but their understanding is that the fireworks have been canceled. The NYPD has also deployed special counter-terrorism forces and heavy police patrols, with officers deployed at the city's 1,205 polling places. "This is by far the largest election detail the NYPD has ever had, it is more than double our previous high," Chief of Department Carlos Gomez said. "It is comparable to New Year's Eve and Pope Francis." Mayor Bill de Blasio said New Yorkers should expect security is tighter than normal. "You're going to see a lot of officers out, particularly our critical response command and strategic response group officers," de Blasio said. "You're going to see a lot of measures taken very visibly around all of the election activity on Tuesday. Obviously all five boroughs, particularly the events will be around the candidates in Manhattan." As in past years, the NYPD is using mobile radiation, bomb detectors and bomb-sniffing dogs. Officers toting heavy weapons are mobile and not assigned to fixed posts so they can move around at a moment's notice. There are additional layers of officers with heavy weapons provided by department's new Strategic Response Group and Critical Response Command.